Far more people these days are aware that they are either coeliac or they have a gluten intolerance. As those with these conditions know, it can be expensive buying suitable ready made food all the time - and it can be a little boring too. These recipes cater for those who want to avoid both gluten and sugar. They offer several alternatives for making biscuits, but the cook must read the labels on all ingredients he or she adds to ensure that everything used really is suitable. This is a plain biscuit that may be dressed up in any way you fancy. Try adding fruit or diabetic chocolate before you mix it into a dough. Preheat your oven to 180 deg C/350 deg F/gas mark four. Melt your butter and honey in a small pan over a low heat. Sieve your gluten-free plain flour and baking powder into a large bowl, and mix. Slowly stir in your hot mixture until you have a good dough. Take small handfuls and roll into balls. Place the balls on a greased baking sheet and press down with a fork. Bake in the centre of the oven for about 10 minutes. Remove from the heat and allow to cool. This recipe calls for sugar free raspberry jam. Do remember to check the label to make sure it was processed in an uncontaminated environment, however. Preheat your oven to 180 deg C/350 deg F/gas mark four. Beat your butter and jam in a large bowl until light and creamy. Beat your egg in a small bowl then stir into your creamy butter mixture. Squeeze your lemon, then add one tbs of the juice. Slowly add your dry ingredients until you have a dough. Take small handfuls and roll into balls. Place on a greased baking sheet and press down with a fork. Bake in the centre of the oven for about 10 minutes. Remove from the heat and allow to cool. 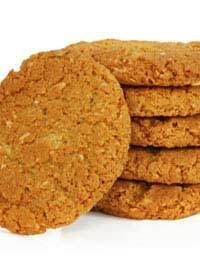 These are tasty nutty biscuits that everyone will enjoy. The coconut brings a really nice texture to the biscuit as well as a rich flavour. Preheat your oven to 180 deg C/350 deg F/gas mark four. Melt your butter and honey in a small pan over a low heat. Sieve your gluten-free plain flour and baking powder into a large bowl. Add your desiccated coconut. Slowly stir in your hot mixture until you have a dough. Take small handfuls and roll into balls. Place on a greased baking sheet and press down with a fork. Bake in the centre of the oven for about 10 minutes. Remove from the heat and allow to cool.